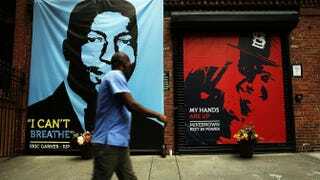 A memorial to Eric Garner, next to one for Michael Brown, is viewed outside filmmaker Spike Lee’s 40 Acres offices in Brooklyn, N.Y., Aug. 15, 2014. A New York City Police Department sergeant has been stripped of her gun and badge and barred from doing any street enforcement for her role in the 2013 death of Eric Garner, according to the New York Times. Garner died on a street in the New York City borough of Staten Island on July 17, 2013, after police approached and forcibly arrested the 43-year-old father, who they believed was selling loose cigarettes. One of the officers, Daniel Pantaleo, jumped on Garner's back and placed him in what appeared to be a choke hold. The altercation was captured on video in which Garner can be heard yelling, "I can't breathe." He was pronounced dead shortly after the incident. Garner's last words became a rallying cry for those protesting police brutality. On Friday, Police Sgt. Kizzy Adonis, 38, "who was a probationary supervisor assigned to the 120th Precinct on Staten Island's North Shore" and was at the scene of Garner's death, was placed on modified duty after an internal investigation, the Times reports. To date, Adonis is the only officer to face any discipline regarding Garner's death, according to the Times. Supervisors who were on the scene during the altercation have been faulted for never gaining control of a situation that ultimately led to Garner's death. The move against Adonis has been labeled procedural, since the department was closing in on the 18-month statute of limitations in the Police Department's labor contracts, which require that if charges are filed, they must be filed within the allotted time frame. Edward D. Mullins, the head of the sergeants union, told the Times that the officers and their supervisors did nothing wrong.